We have lots of different activities for campers to try! At camp we believe in challenge by choice – we want campers to challenge themselves in a safe, warm and supportive environment. All campers are supported to try new things and have fun! The theme is developed around a storyline that continues throughout the week. Every day, we have an “all camp” activity, where the whole camp comes together to do something related to the theme. Twice per day we have Regular Programming (RP) blocks. These blocks are when programmers open up their area’s for campers to come to. Campers have the choice of whatever they want to participate in. Counsellors do their very best to make sure everyone is doing their activity of choice (after all, this is THEIR week at camp!) Some campers might decide to try the climbing wall, then head to arts and crafts to make a button, and then go catch the last half an hour in the pool. Swimming Pool: The pool at Camp Winfield is an accessible outdoor pool. 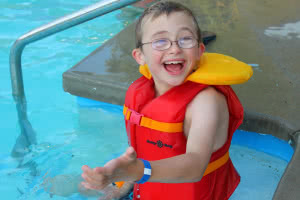 The pool is always supervised by a lifeguard and at least one counsellor for every three campers. Sponge fights, cannon ball competitions and diving for rings are some favourite activities in the pool. Climbing Wall: The outdoor wall at Camp Winfield gives campers the chance to high five with spiderman! 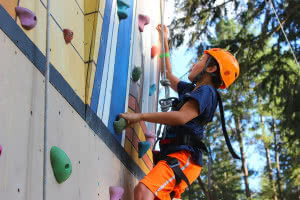 This wall offer campers the chance to challenge themselves – for some that means racing to the top and for others that means just coming over and checking out what it feels like to wear a climbing harness. We have a 4-1 pulley system in place so practically everyone has a chance to climb the wall. The wall is run by a specially trained programmer. Giant Team Swing: This giant swing gives campers a chance to be raised up almost 40 feet by their friends and then, when they are ready, release themselves and swing back and forth high above camp. The great part is – it is entirely up to the camper how high they want to go! Low Ropes Course: This course lets campers try out their skills balancing, working as a group, and manouvering around the elements. Arts and Crafts: Everyone loves tie dye, silkscreening, making cool birdhouses, playdough, drawing, painting, bead buddies you name it! We love the random chaos and amazing projects our campers make! Movie Making, Drama and Music: Our campers are all superstars and we love to see them in action. Some budding film makers and actors love the chance to make movies about their adventures at camp. We love doing talent shows, kareoke, and drama games that allow campers the opportunity to show off the performer in themselves. Waterslide: At Camp Winfield we have an accessible waterslide. Campers and staff love it! Slip and slide, shaving cream fights, prank pulling, costume wearing and lots of other fun things also happen frequently at camp. Snozelin Room: Camp Winfield has a specially created Snozelin room. These multisensory rooms have massage mats, fiber optic lights, soothing music, aromatherapy, bubble tubes and other interactive things for campers of all abilities to enjoy. There is a maximum of 4 people in the snozelin room at any time, so it is a nice, quiet space. Personal Programming: Depending on the interests of the campers, the counsellors will do special fun things with their groups. Scavenger hunts, offsite walks or hikes, prank pulling, legacy projects, special tea parties and other fun things that help make camp the best possible experience for campers. Park Day: Usually on the third or fourth day of every week we have a park day. Everyone heads outside to a nice grassy area of camp and we set up some fun, chill activities. 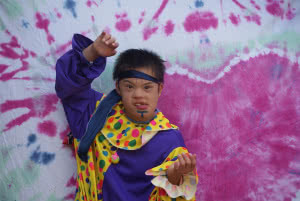 Park day is a great time for tie dye, make overs, story telling, drumming and field games. We always have a nice picnic lunch on park day. Movie Night: Often the evening after park day we have movie night. What a great excuse to eat popcorn! We usually offer a couple different movies so campers can choose. Camp Out: Each night a couple of groups pack up their sleeping bags and toothbrushes and head for the backyard camp out area. The campout programmer will serve them up some delicious dinner and help set up tents. Then it is time to do all the favourite camping things like marshmellow roasting and camp fire songs. Counsellors always sleep right outside the door of the tents in case campers need anything in the middle of night. Banquet Night and Dance: The last night of camp we all get spiffed up for a fancy sit down dinner. 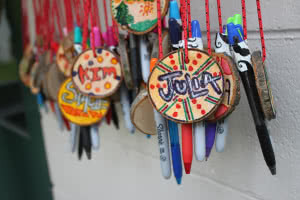 Each camper receives a unique award created by their counsellors that highlights some special contribution that that camper made during camp. After the food, the music begins as everyone gets into the best dance party you’ll ever attend. Kangaroo Kourt: All week long campers observe their counsellors each and every action. If a counsellor promises a piggy back ride and then forgets, you know what is going to happen. That camper is going to write up and put that crime into the Charge Box. On the second last morning of camp, everyone gathers around as Kourt opens session. Charges range from not enough red fruit loops in the cereal bowl to making campers go to bed too early. No one escapes the strong arm of camper justice. Oh, and the top punishment, you ask? GOO poured on your head!! EWW!